Caffe Latex- Now in a carry-along size. Tubeless gravel road specific tires are now becoming more and more prevalent and we are currently testing a few of the newest models with varying features. One thing they all have in common- they all need sealant to be successful. We have just received a couple of interesting sealants to try out on our test tires. The first is from a well known company with an Italian connection and the other is from a newer company you may not know well, or at all, but is well versed in the sealant game. This sealant is a well known one and has been around a while. Sold by Effetto Mariposa, the company started by Alberto De Gioannini in Switzerland has all of its products produced in Italy. These products are distributed and sold in the U.S. by Cantitoe Road. Caffe Latex’s foaming action is unlike that of ordinary sealants. Caffe Latex’s main claim to fame is that it has a unique, foaming action which more evenly distributes the sealant throughout the tire’s volume so that it can better seal a puncture no matter what part of the tire is punctured- side wall or tread area. 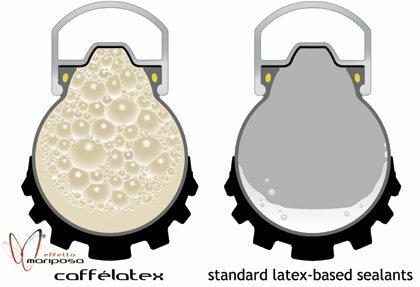 Caffe Latex also has a new formula with microscopic silica particles that has a claimed 5 times faster sealing property than their previous formula. Caffe Latex has an operating temperature range of -30C to +50C. Caffe Latex also boasts a long service life, (up to 12 months depending upon circumstances), and a non-ammonia based formula which results in no corrosion issues in aluminum rims. Other sealants with ammonia based carriers can corrode aluminum which can lead to problems down the road. Caffe Latex is available in several forms, but for this post we are focusing on their newest pouch based offering which has the benefit of being able to be carried along on rides for replenishing a tire that may have expended much of its sealant before finally sealing up. This could be a life saver on some of the more remote, self-supported events, or on long rides where you may need to be self-reliant in terms of repairs. The 60ml pouches sell for $7.95 USD and come with a section of tubing for easy application through your valve stem. The Caffe Latex sealant will feature in our review of the new Clement 36mm tubeless tires, so stay tuned on a word or two about how it performs later on here. 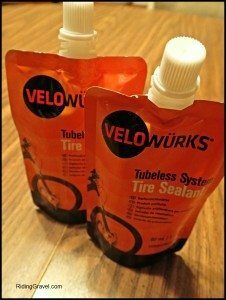 Velowurks has a unique formula for sealing up your punctures and tubeless tires. This company, which is maybe not as well known to many in the cycling world, has been around making sealants for the agriculture vehicle and automobile markets for a decade. Using a formula that is unlike most anything you may be familiar with, this sealant boasts a lifespan of 6 months and an operating temperature down to -30°F. It is a low viscosity liquid sealant which is eco-friendly and non-toxic. It has a claimed sealing performance for punctures up to 3mm in diameter. Velowurks claims its sealant uses a unique blend of emulsifiers and microfibers that react quickly in sealing a puncture in the tire and will not “ball up” over time. In fact, they claim it cleans up with water easily should you want to swap out a tire or need to re-up on your sealant after its lifespan has been passed. We will be testing out Velowurks in various applications including gravel tires here and will report on its performance. Velowurks sells this sealant in the 90ml pouches, (pictured), in a 500ml plastic bottle, or in a 2 liter jug with a pump and tube for ease of application. Pricing for the various sizes is as follows: 90ml- $4.50, 500ml bottle- $19.50, and the 2L jug- $76.50. All prices are USD. Velowurks also makes a separate product for use in inner tubes. 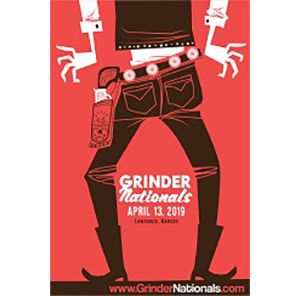 See their site here. Velowurks sealants are available in local bike shops. With the advent of carbon frames for gravel riding and considering the damage that rocks can do to paint, this next product is unique and a handy thing to help you keep that bicycle frame looking fresh after thousands of miles of gravel travel. Shelter is a product by Effetto Mariposa that the company sent along in its package to us with the Caffe Latex sealant. It is a visco-elastic, clear protective film that is self-adhering and is shock and scratch resistant. Shelter is sold in bulk rolls or in smaller kits. 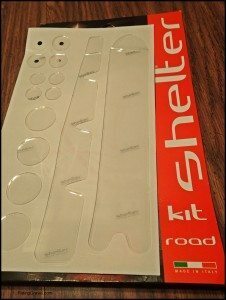 We received the “Road” kit which has a strip for under the down tube, one for the drive side chain stay, and various round patches for cable rub areas on the head tube or wherever you may have high wear issues from accessory items. 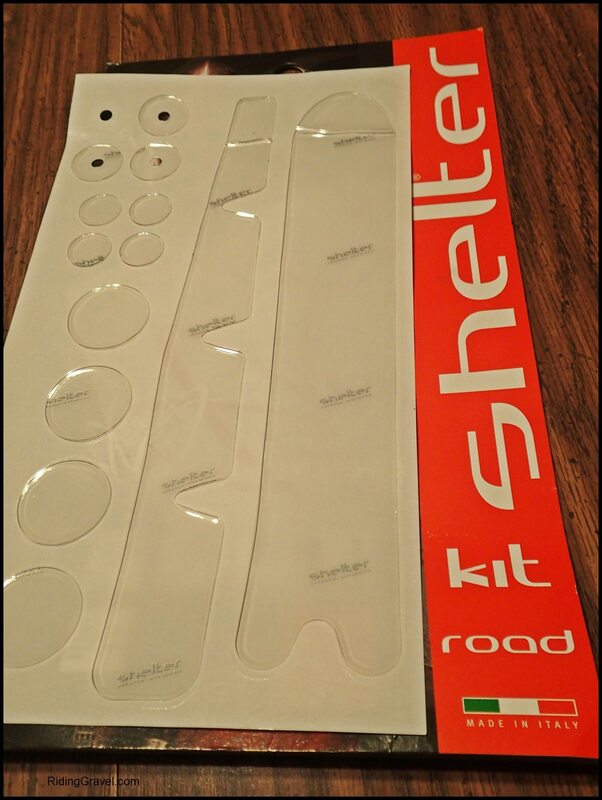 The road kit sells for $29.95 and is available directly from Cantitoe Road’s website. I have used this product before and it works really well. It adheres without peeling back, conforms to irregular shapes pretty well, and when you want to remove it, it doesn’t leave any sticky residue behind. Shelter is also available in strips which can be cut into smaller pieces or various shapes depending upon your specific needs. We will be putting this through its paces on one of my own bikes here to see how it does with regard to long term use. Note: Cantitoe Road and Velowurks sent over these products for test/review at no charge to Riding Gravel. We are not being paid nor bribed for these reviews and we will strive to give our honest thoughts and opinions throughout.